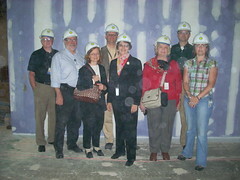 Smithsonian Libraries’ staff visited the new Pennsy Drive facility near Landover, Maryland on May 29. The Pennsy Drive facility will house the Book Conservation Lab, the SIL Imaging Center, binding operations and also provide a reading room and shelf space for over 500,000 volumes. The Libraries will begin moving into the new space sometime in the fall.